When the unagi craving strikes in Kichijoji, head straight for this unpretentious joint that’s been keeping locals well fed on quality eel and run-of-the-mill izakaya grub for over five decades now. Enter from a narrow alleyway just off the Sun Road shopping arcade and you’ll find yourself in a down-to-earth, sparsely decorated space dominated by a huge flat-screen TV on the back wall and inhabited by chain-smoking local salarymen and elderly folks (there’s a more comfy, family-friendlier room upstairs). Sure, Unatetsu may not score many points in the atmosphere column, but there’s nothing wrong with the stamina-packed, charcoal-grilled delicacy that gives the place its name. 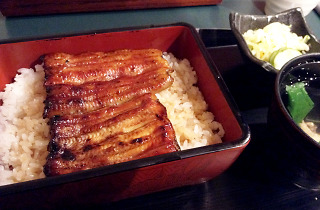 The basic unaju (unagi over rice plus soup and pickles) comes in three varieties (¥2,200-¥3,300), while more extensive teishoku options (from ¥3,250) and Nagoya-style hitsumabushi (¥3,600) are also available. Our most recent visit – in early January – saw very competently grilled, lightly flavoured and pleasantly fatty fare that adds up to quite decent value, especially when it comes to the cheapest (‘梅’) unaju option. Besides unagi, the menu also lists everything from tempura to kushiyaki, but these sides aren’t that attractively priced and make for little more than a distraction. 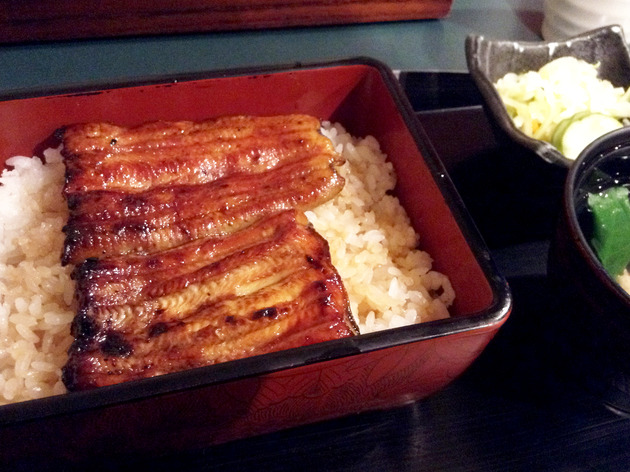 Although the lack of local competition means it’s usually the default option for anyone seeking an eel-powered boost in the area, Unatetsu hasn’t given in to complacency – an admirable feat in itself.